There is a list of phrases used in creative services teams we’ve deemed harmless because we hear them so often. Phrases that lead you to believe tasks are going to be done on time, but in reality they’re not, which means you’re going to miss another deadline. 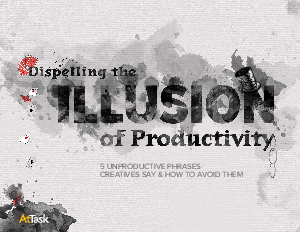 This ebook exposes five common phrases that create the illusion of productivity, but are hiding serious productivity problems. “It’s about 80% done.” This phrase is fine if you have actual evidence to show that a project or task is, in fact, 80% done. But when “80%” is a rough estimate that someone picked because they were under pressure and it sounded good, you’ve got problems.